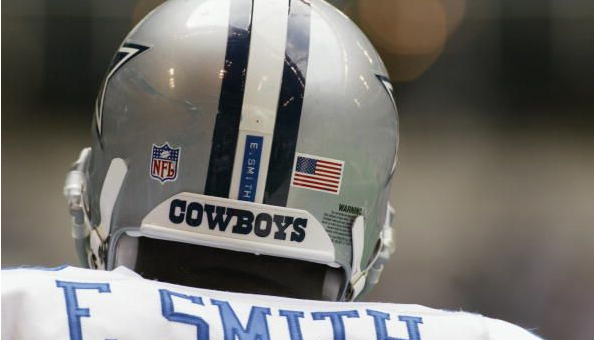 Look on the back of any Cowboys helmet, and you'll see a little blue label at the base of the white stripe. You've probably noticed it countless times over the years without even thinking about it. 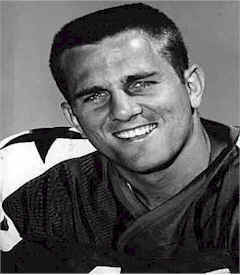 That's a Dymo Tape name label, which has been a Cowboys visual signature for years -- all the way back to the mid-1960s, in fact. Uniqueness Factor: High. 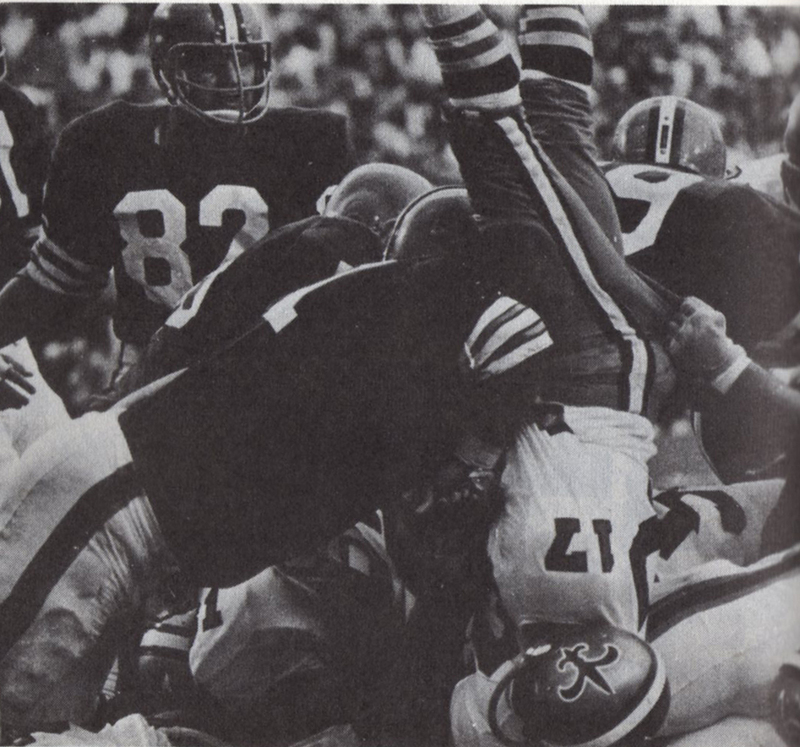 Smartypants readers (you know who you are) may be aware that Dymo Tape has occasionally been used for helmet identification by other NFL teams, like the Browns in the late '60s (plus it's also been used extensively in baseball). But no other team has had the chutzpah or intestinal fortitude to use the little labels so obsessively, or for so long. Annoyance Factor: Low. Uni Watch actually loves the little labels and grudgingly salutes the Dallas equipment staff for having the dedication to turn a dorky little detail into an indispensable component of the club's visual identity. 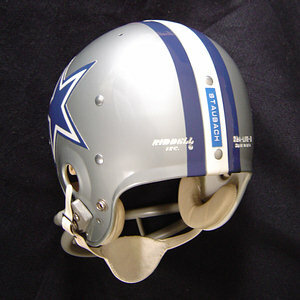 Just try to imagine a Cowboys helmet without the little blue strip -- it's unthinkable. 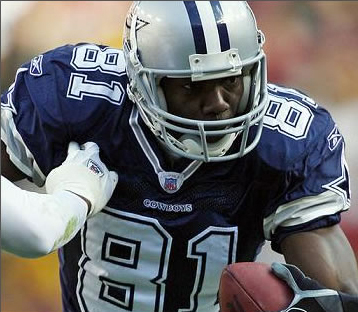 Ever notice that the lower collar area on most of Cowboys jerseys -- just above the uniform number -- usually looks a bit pinched or crimped? Look closer, and you'll see there's actually a little shoelace or string that's tying down the jersey to the shoulder pads. How do they do this? By sewing a butterfly-shaped fabric panel onto the sternum area of each jersey. 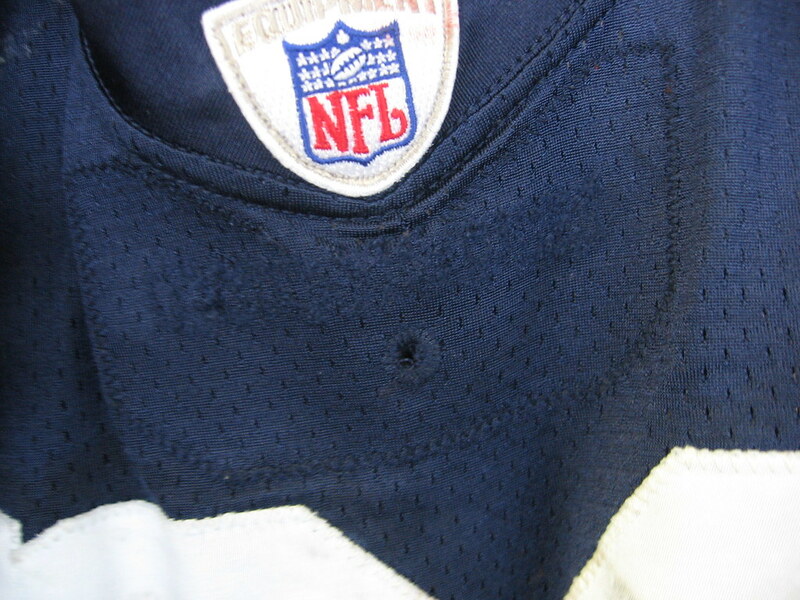 The panel is equipped with an eyelet, which the player can use to tie down the jersey to his pads. Sometimes additional eyelets are added so the player has multiple tie-down options. Uniqueness Factor: Very high. To Uni Watch's knowledge, no other team utilizes this type of jersey modification. 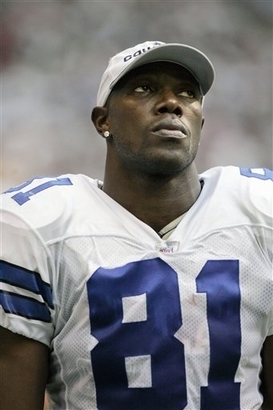 A few former Cowboys, however, have tried to duplicate it after moving on to other teams. 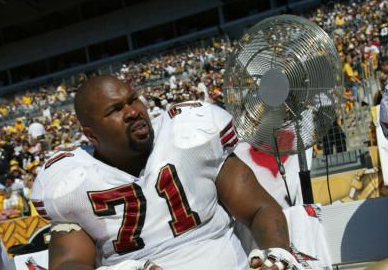 Keyshawn Johnson, for example, used a primitive tie-down when he moved from the Cowboys to the Panthers, and Larry Allen has been going tied-down with the 49ers. Annoyance Factor: Very high. The crimped collar looks totally bush. And even if a player opts not to use the tie-down, you've still got that extra fabric panel just sitting there in plain view. Plus, there's something untoward about modifying a uniform like this -- is it even legal? Roger Goodell, please investigate. 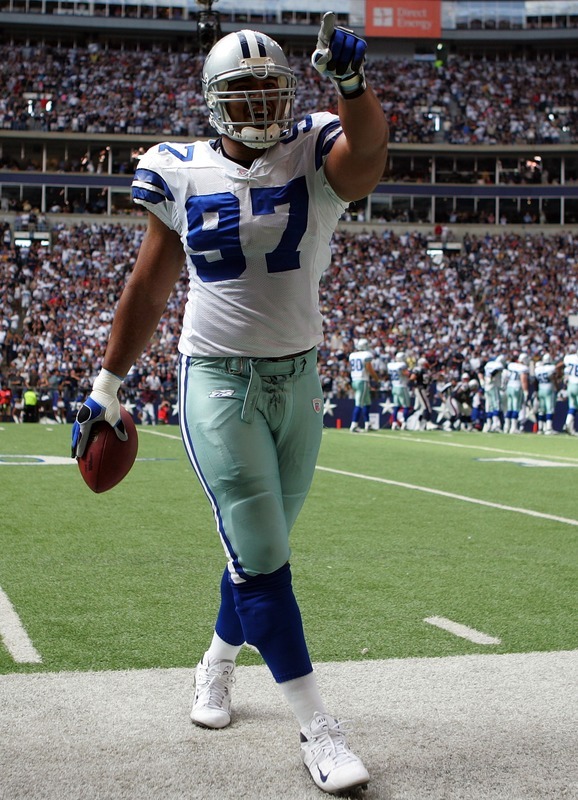 The Cowboys always wear silver pants, right? Right -- sort of. The team actually has two different sets of silver pants in its wardrobe: one with a greenish-blue tone and royal blue piping, which is worn with the white jerseys, and a more conventional silver version with navy piping, which is worn with the club's seldom-seen blue jerseys. No vaguely reasonable explanation for this has ever been proffered. 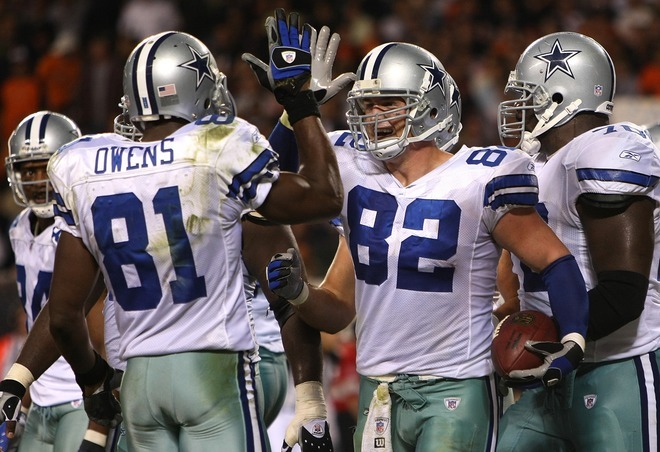 Not only that, the Dallas helmet doesn't match either of the pants' hues, meaning the Cowboys actually use three shades of silver. Uniqueness Factor: Very high. Some teams occasionally have trouble matching their helmet color to their jersey or pants, because fabric dyes work differently than plastic dyes. But the Cowboys don't have one intended version of silver that accidentally turns out three different ways -- they actually have three different silvers in their official color specs. 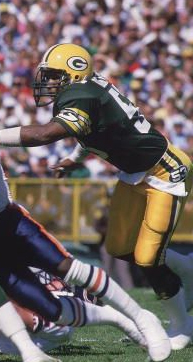 No other NFL team has this kind of color confusion codified in its uniform design. Annoyance Factor: Very high. Kindly pick one silver and stick with it for all applications, end of story. 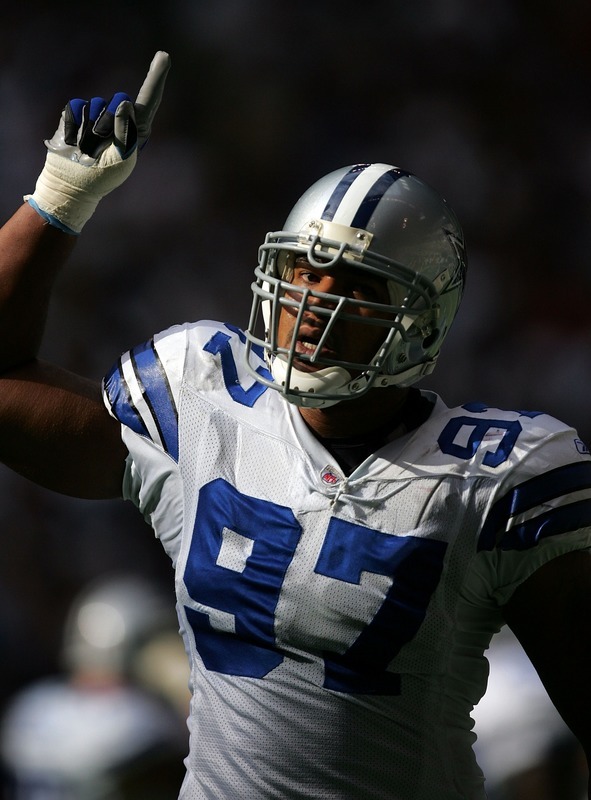 The Cowboys' chromatic inconsistencies go beyond silver. When they wear their white jerseys (i.e., about 90 percent of the time), their socks, pants striping and uni numbers are royal, but the blue on their helmets is navy, so the two blues clash. Uniqueness Factor: Very high. Other NFL teams understand the simple concept that your colors should match. Annoyance Factor: Huge. Are these people colorblind, or what? Wearing dark jerseys at home has been an unofficial football tradition for generations, but the Cowboys opted to buck that trend during the franchise's earliest days. It was GM Tex Schramm's idea: He figured that if the team wore blue at home, every home game would look the same -- blue jerseys versus white jerseys. By wearing white at home, the team would give its fans a chance to see an ever-shifting range of colors as a new team came into town each week. 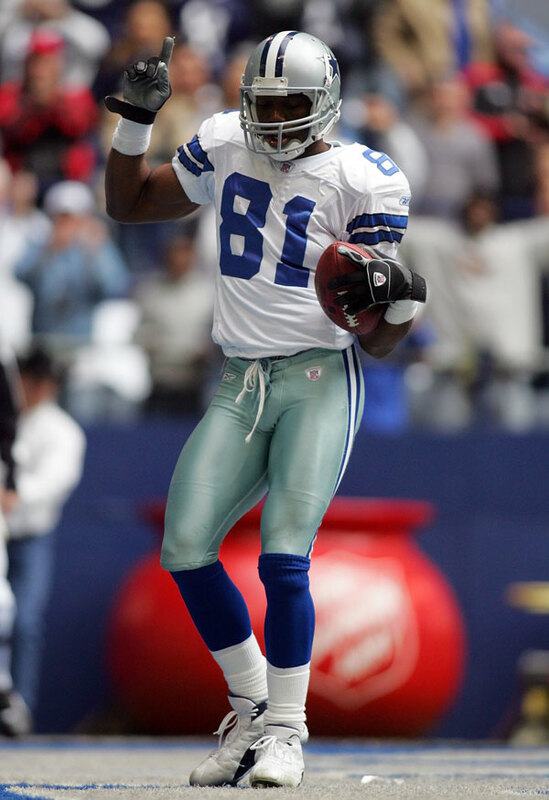 Since most other NFL teams chose to wear their colors at home, the Cowboys usually ended up wearing white on the road, as well. Uniqueness Factor: Medium-high. Other teams have favored home whites over the years, most notably the Redskins, Dolphins and Browns. Plus, some warm-weather teams opt to wear white at home early in the season to avoid baking in the sun. But the Cowboys were the first to go this route, and they've stuck to it more single-mindedly than any other club. The Cowboys were the designated home team in Super Bowl V, which meant they had to wear blue (the rule since has been changed to allow the designated home team the choice of wearing white or colors). Dallas lost the game, and the legend of "the blue jersey curse" was born. 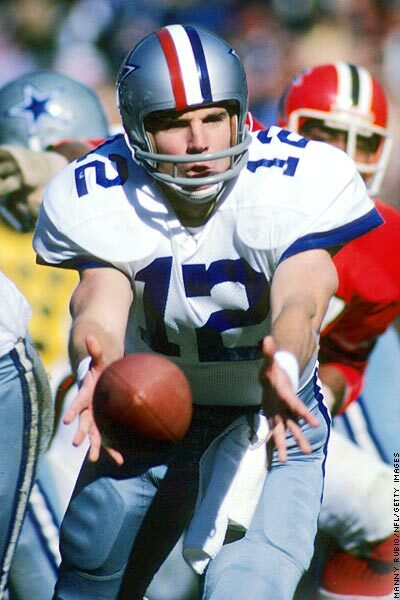 In subsequent years, opposing teams periodically have worn white at home just to force Dallas to wear blue -- most famously in the 1981 NFC championship game, when the Eagles wore white at Veterans Stadium and won, thereby cementing the blue jersey's status as uni non grata. Uniqueness Factor: High. While there are other NFL teams that prefer to stick with one jersey, no other team has developed such lore and superstition around one uni element. Annoyance Factor: Low. Uniform-based rituals and mythologies are A-OK with Uni Watch. Most teams' white and dark jerseys are essentially mirror images of each other. There might be minor distinctions, but they pretty much have the same typography, the same striping and so on. 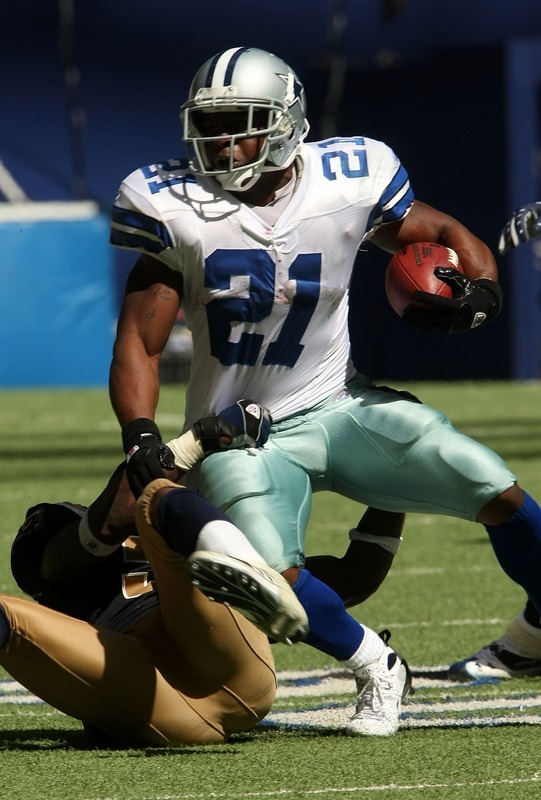 But look at the Cowboys: The white jersey has block uni numbers, two plain stripes on each sleeve and no wordmark on the chest, while the blue jersey has outlined uni numbers, a thick, star-studded stripe on each sleeve and a "Cowboys" wordmark on the chest. It's not just that these jerseys aren't twins -- they are barely second cousins. Uniqueness Factor: Very high. No other NFL team has this type of disparity between its jerseys. Annoyance Factor: Very high. Yo, people, look around at the rest of the league, see how it's done and please get with the program. 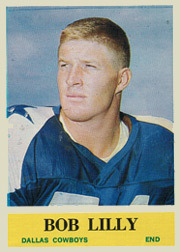 In 1982, someone decided it wasn't enough for the Cowboys to have uniform numbers on their chests, backs and shoulders. And so it came to pass that the Cowboys began wearing uni numbers on their hips -- useful if you're trying to identify a player who's only partially shown in a photo, but pretty bogus-looking otherwise. The 'Boys stuck with this format until 1989, when sanity, in the form of numberless pants, was restored. Uniqueness Factor: Fairly high. Only two other NFL teams have gone this route -- the 1984-87 Packers and the 1982-86 Colts. Annoyance Factor: Massive. One of those "innovations" that nobody was clamoring for. A solution to a non-problem. Textbook case of failing Uni Watch's standard "Is it good or is it stupid?" litmus test. 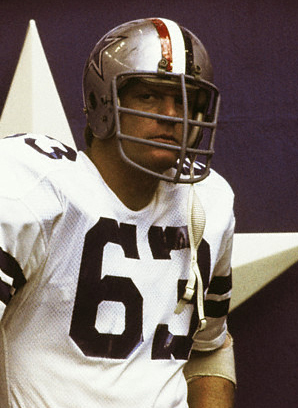 Not many people seem to remember this, but the Cowboys gave new meaning to "America's Team" in 1976, when they changed one of their helmet stripes from blue to red, creating a patriotic effect for the nation's bicentennial. Uniqueness Factor: Very high. No other NFL team modified its uniform -- much less introduced a new hue to its color scheme! -- for the bicentennial. Annoyance Factor: High. Truth be known, Uni Watch kinda likes this move, at least when viewed in a vacuum. But in the context of all the "America's Team" nonsense, it's just another example of the institutional hubris that makes it so easy -- so necessary -- to hate the Cowboys. 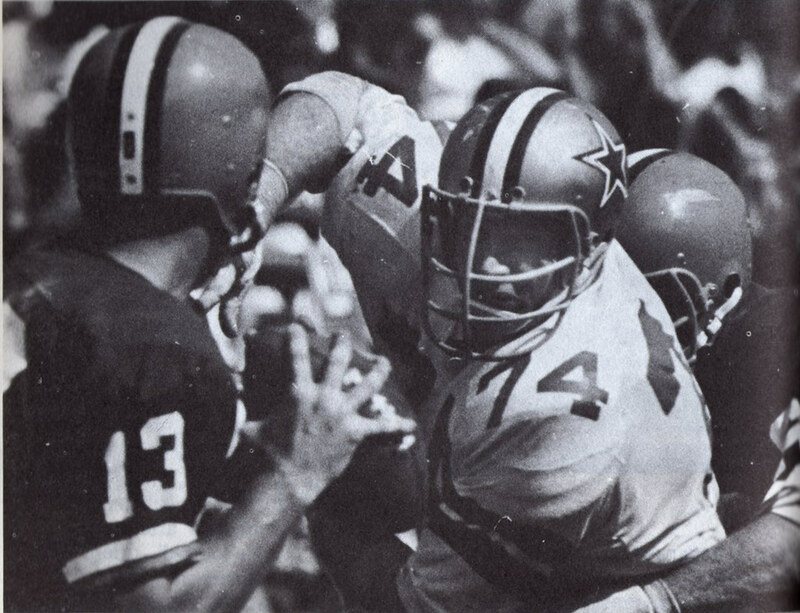 Little-known fact: During the Cowboys' first four seasons, they wore a bizarre crossover-style collar, which created an odd wraparound effect that didn't look so hot. Further details and lots of additional photos are available here. Uniqueness Factor: Off the charts. As far as Uni Watch knows, there's nothing else like this in NFL history. Annoyance Factor: Negligible. While the collar looked awful, it was one of those obscure historical subtleties that are Uni Watch's raison d'�tre. When Tom Landry died in 2000, the Cowboys decided to memorialize him on their uniform. But instead of taking the boilerplate approach of wearing his initials on a helmet decal, they took his signature fedora and depicted it as a chest patch. Uniqueness Factor: High. Uni Watch can't think of another NFL team that's used a simple graphic symbol as a remembrance. Annoyance Factor: Exceedingly high. In fact, this is arguably the most annoying Dallas quirk of them all, because it's so brilliant. How's Uni Watch supposed to keep hating the Cowboys when they come up with something this cool? Remember Uni Watch's visit with Giants equipment director Joe Skiba? He recently invited Uni Watch back for a return visit, during which he shared lots of uni- and equipment-related arcana. For full details, look here. Paul Lukas somehow found himself dating a Cowboys fan throughout the 2003 NFL season, which was very stressful for all concerned. His Uni Watch blog, which is updated daily, is here, his answers to Frequently Asked Questions are here and his Page 2 archive is here. 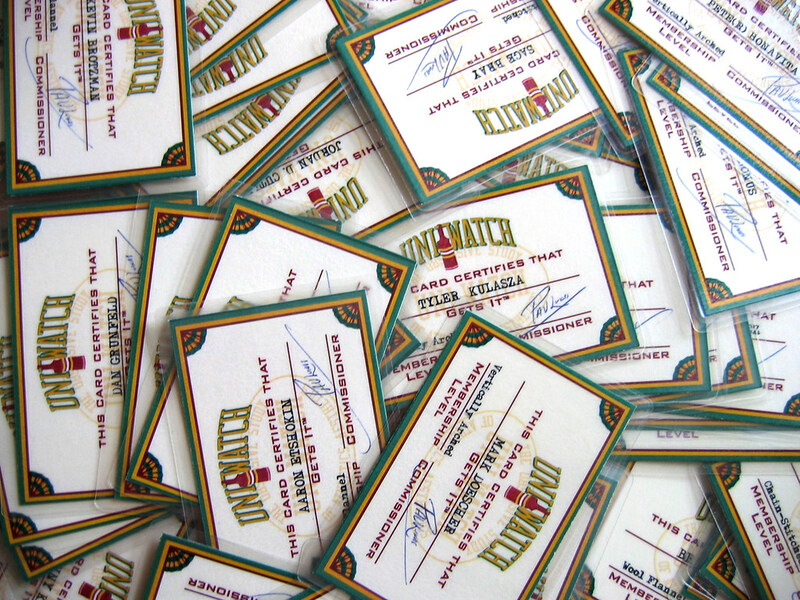 Want to learn about his Uni Watch membership program, be added to his mailing list so you'll always know when a new column has been posted, or just ask a question? Contact him here.